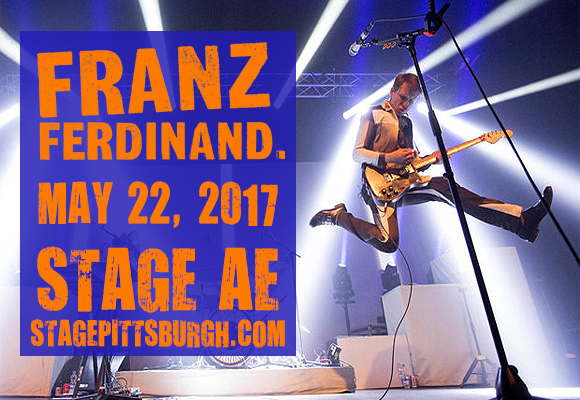 Perky Scottish indie-rockers Franz Ferdinand, who last hit the road with quirky synth-pop oddballs Sparks as FFS, are heading back to the US this summer for a nationwide tour that sees them hitting up Stage AE on Saturday 27th May 2017! Expect a high energy show from the band, for whom this will be their first full-length stint in three years! Bursting onto the British indie rock scene in 2003 with the release of their debut EP, Darts of Pleasure, Scottish band Franz Ferdinand proved to be one of the most popular bands of the post-punk revival, selling over 3 million albums worldwide. They first came to public attention with their January 2004 single Take Me Out, which went on to be globally popular, charting in several countries, and earning a Grammy nomination for Best Rock Performance by a Duo or Group with Vocal. The band's eponymous debut studio album was released one month later, winning the 2004 Mercury Prize and earning a Grammy nomination for Best Alternative Album. To date, the band have been nominated for several Grammy Awards and have received two Brit Awards—winning one for Best British Group, as well as one NME Award.